Choose your favorite colors or show your team spirit with frill and bling. 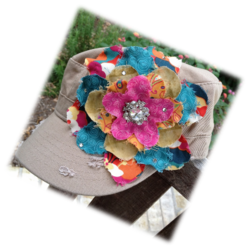 All hats are originals....fabric, patterns, and bling will vary from hat to hat. Please select row and position if you would like your design to be based off of a previous example. Because each hat is custom made, please allow one week plus shipping time for delivery. For local pickup, you will receive an email or phone call for pickup arrangements.